Bananas are something we always have in abundance, and that was my case this weekend. So, I tried a new spin on a banana bread. Preheat oven to 350Â° and spray surfaces of a 10-inch non-stick tube pan with non-stick cooking spray or flour and grease. Cinnamon Walnut Streusel: Add walnuts to your food processor and pulse 3 times. Add flour, brown sugar and cinnamon and pulse a few times to combine. Sprinkle cold butter over top and pulse until the walnuts are chopped and the mixture resembles small pebbles. You can crush the walnuts and combine the butter with your hands. Cake: In a medium bowl, whisk together flour, baking powder, baking soda, salt, and cinnamon. Beat butter and sugar until fluffy on medium high speed, about 3 minutes. Add eggs, one at a time, beating just until the yellow disappears after each egg. Mix in vanilla and bananas just until combined. Gradually add flour mixture to banana/butter mixture in thirds, alternately with sour cream/yogurt in between each third. Beat until just combined. Measure out 1/4 cup batter and set aside for cream cheese filling. Stir chocolate chips and walnuts into remaining batter just until combined. Measure out 1 cup batter (to top cream cheese layer) and spoon the rest of the batter into the prepared pan. Cream Cheese: Add 1/4 cup reserved batter, cream cheese, 1 teaspoon vanilla and 1/4 cup sugar. Beat on medium high speed until smooth and creamy, about 1 minute. Spoon cream cheese filling over batter and gently smooth, but do not touch the sides of the pan. Spread reserved 1 cup batter evenly over filling (it will be very thin). Sprinkle evenly with Cinnamon Walnut Streusel. Bake for 55-60 minutes or until toothpick inserted comes out clean (without inserting in cream cheese). Let baked cake cool on wire rack for 1 hour. When ready to serve, whisk Vanilla Glaze ingredients together in a medium bowl and drizzle over cake. 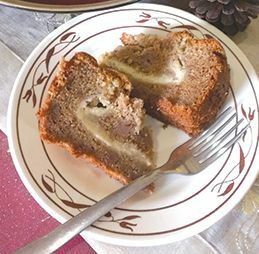 Tip â If you donât want all those extras in your banana bread, simply use the cake section of this recipe.